What’s Your Fave Nosh at Sporting Events? Peanuts. The shelled kind. Not the gallery. Ice cream. Sundaes, cones, frosty malts…I love them all. Hot dogs. 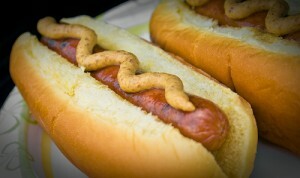 Sports=hot dogs. ‘Nuff said. Nachos. Nitro queso es mi amigo. All of it. I don’t discriminate. None of it. I’m there for the sports, not the food, ladies! Other. I’ll tell ya in the comments. Nice article. Well I usually interested to take peanuts, ice creams and popcorn because these are light to take. At KU football and basketball games, my favorite treat is a big strawberry limeade or lemonade. It's great for quenching the thirst after all that cheering!